Make a batch of Sweet Potato Milk Bread Dough (see below) on the Tuesday or Wednesday before Thanksgiving or any big celebratory weekend. Shape half of the dough into the Pull-Apart Dinner Rolls for a dinner centerpiece, and use the other half to prep these cinnamon rolls to serve for breakfast the next morning. No hangover can resist the power of cream cheese frosting, I promise. Butter a 9-inch square cake pan. Line a rimmed baking sheet with parchment paper. Put the dough on a lightly oiled work surface and pat it into a rectangle with a long side near you. Using a rolling pin, roll the dough into a rectangle that is about 18 × 12 inches and 1/4 inch thick; it is more important that the dough be 1/4 inch thick than an exact-size rectangle. In a small bowl, combine the brown sugar and cinnamon. Using an offset spatula or the back of a spoon, spread the soft butter in a thin, even layer over the surface of the dough. Sprinkle the brown sugar– cinnamon mixture over the butter. Beginning with the long side nearest you, lift up the edge of the dough and roll it away from you into a tight coil. Pinch the edge to seal, and then place the roll on the prepared baking sheet. Pop it into the freezer for 10 minutes. Make the icing: In a medium bowl, beat the cream cheese and butter together until smooth. Add the confectioners’ sugar and vanilla, and beat again until smooth and fluffy, about 1 minute. Icing can be kept at room temperature for up to 1 hour; cover and chill for up to 3 days. Bake the rolls until golden and cooked through, 20 to 25 minutes. Remove the pan from the oven and immediately spread the rolls with the icing. Let cool for at least 15 minutes before eating. Serve warm or at room temperature. 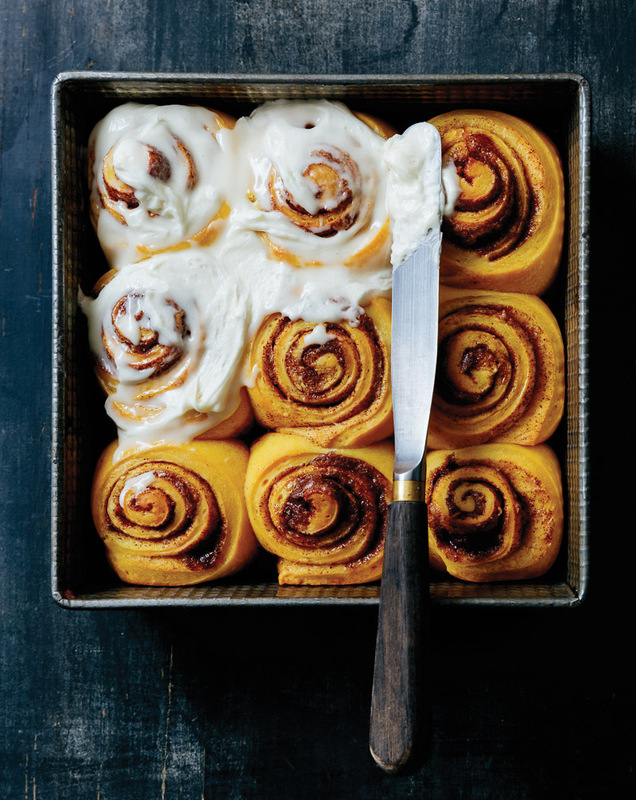 Note: Make extra and freeze them: Shape the cinnamon rolls and arrange them 1 inch apart on a parchment-lined baking sheet. Freeze until frozen solid, then transfer to a gallon-size plastic zip-top bag. The day before baking, arrange them in a buttered 9-inch square cake pan, cover with plastic wrap, and defrost in the fridge. Let stand at room temperature until puffy, about 2 hours, before baking as instructed. This versatile dough is endlessly adaptable. Use it in the many variations in the following pages. In the bowl of a stand mixer or a large bowl, gently stir together the 1 cup warm milk, 1 tablespoon of the sugar, and the yeast. Let stand until the mixture becomes foamy, about 5 minutes. Brush a large, clean bowl with some melted butter. Shape the dough into a ball and set it in the bowl, seam-side down. Cover the bowl loosely with plastic wrap and let rise in a warm spot until almost doubled in volume, about 1 hour. Punch the dough down and use immediately or refrigerate for up to 24 hours. Note: You’ll notice that the flour amounts are given in both volume and weight. Measuring either way is fine, but I find that, when baking, knowing the weight of flour is helpful, since it is a more accurate measurement. Copyright © 2017 by Mary-Frances Heck. Photograph by Kristin Teig. Published by Clarkson Potter/Publishers, an imprint of Penguin Random House LLC. As you might imagine, we love sweetpotato toasts. But we also love taking that idea and turning it into bite-sized snacks and apps! Just like full-sized toasts, sweetpotato toast bites can be topped with pretty much anything you like—try a dollop of dip and a sprinkle of nuts, a slice of ham and a chunk of cheese, or a spoon of peanut butter and your favorite fruit. This particular version, dressed up with dried figs, blue cheese, and a sprinkle of flaked salt, is easy yet impressive. Serve it for company, holidays, or any time you’re in the mood for something special. Cook the sweetpotato slices in your toaster oven as you would small slices of bread, using the most well-done setting, until tender (you might have to do this in batches, and each batch might have to cook two times). Set aside to cool to room temperature. Top each sweetpotato slice with 1 teaspoon of blue cheese, 1 fig quarter, and a rosemary sprig, arranging them on plates or a platter. Sprinkle with the salt and pepper, then drizzle with the honey and serve. Note: If you don’t have a toaster oven, use 3 or 4 lengthwise slices of sweetpotato and cook them in your toaster using the most well-done setting (you might have to do this two times). Then cut each toasted slice into 3 or 4 pieces to make 12 smaller toasts. Start your holiday party with this easy appetizer, pairing sweet-savory California sweetpotatoes and wine-plumped California figs. The combination is irresistible! Toast the baguette slices until stiff, about 12 minutes. Set aside to cool. 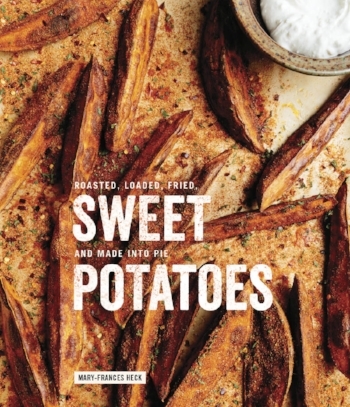 Meanwhile, make the sweetpotato spread: In a medium saucepan, boil or steam the sweetpotatoes until fork tender, about 20 minutes. In a medium microwaveable bowl, combine the honey, olive oil, and rosemary and microwave until warm, about 25 seconds. Add the sweetpotatoes and mash the mixture to a paste. Add the salt and pepper and set aside to cool. Meanwhile, make the red wine figs: In a small saucepan over high heat, combine the wine, orange juice, and brown sugar and heat until just boiling. Add the figs, cover, and set aside for 5 minutes. To assemble the crostini: Drain the figs. Spread the crostini with the sweetpotato mixture, top with one or two sliced figs, and serve.